Ceci est un condo 1 chambre qui dispose de 2 grands lits et un matelas d'air pleine grandeur, si nécessaire. Il est idéalement situé sur un étage élevé. Son balcon privé offre une vue imprenable sur la belle Ft. Paysage de Lauderdale. Dans le confort de votre propre lit, vous pourrez admirer la vue sur les navires qui passent sur les eaux inter-côtières et une vue imprenable sur le coucher du soleil chaque soir. Ce condo est entièrement meublé avec un nouveau mobilier de salon et une cuisine et une salle de bains récemment rénovées. Dans la cuisine, il y a aussi un robinet séparé qui filtre et purifie l'eau potable afin de réduire le besoin d'eau en bouteille. De plus, il y a un téléviseur HD à écran LCD de 40 pouces installé dans le salon, ainsi qu'un téléviseur de 46 pouces pour la chambre. La cuisine contient tout le nécessaire pour se détendre et profiter de votre séjour. Tous les murs extérieurs contiennent du verre teinté spécial résistant aux chocs, du sol au plafond, pour rehausser votre vue déjà magnifique sur le paradis. Alors que les vues spectaculaires appréciées de la copropriété sont de la côte, Ft. Lauderdale s'allume et les couchers de soleil hypnotisants. L'hôtel est situé directement sur la plage. Nos clients peuvent profiter de cette magnifique propriété en bord de mer. Adjacent à la plage se trouve un restaurant en plein air, un bar circulaire et une grande piscine. Il y a aussi un bon restaurant italien à l'intérieur de l'hôtel. Le Galt Ocean Mile est un mile protégé où les visiteurs et les résidents peuvent marcher, faire du jogging, du vélo, du shopping et profiter du kilomètre bordé de palmiers. De nombreux magasins sont accessibles à pied depuis l'hôtel. * Tous les paiements (Echeck & ou cartes de crédit) ont des frais. Tous les frais et suppléments sont prélevés sur le dépôt de garantie remboursable. ** Il n'y a pas de stationnement dans la rue. Actuellement, la concession de stationnement coûte 10 USD par jour pour le service de voiturier et 5 USD par jour si le parking est disponible. Je n'ai aucune affiliation avec la concession de stationnement. *** Il n'y a pas d'animaux ou de fumer autorisé. Great stay in Fort Lauderdale!! We just returned from a wonderful stay at this property. We were met promptly by Scott, the owner, when we arrived. He was so friendly and showed us around the entire resort. The condo is absolutely beautiful. It is well maintained and very comfortable. It has everything you could possible need. The property is within walking distance to many restaurants, shops, and bars. The pool and beach area are great. Everything was very clean. I will definitely stay here again. Scott is available at anytime if you have any questions. We had a relaxing and very enjoyable time. The marketing and the reality are certainly two different things.Very disappointing!!! It is with regret that I am writing this review. I tied to work things out with the owner but no results. I found “Ocean Manor Fort Lauderdale” to be highly overrated!! The marketing and the reality are certainly two different things. Ocean manor was presented as a luxury hotel and is far from that. It is very dirty and noisy; a typical party place. The lobby furniture was filthy. The pool was also very dirty and the lounge chairs were well worn. Not an enjoyable atmosphere. The restaurant kitchen was disgusting and had a fowl smell. Our unit was reasonable but needed repairs and certainly not as advertised. The lounge chair in the condo was so worn out that it was unsafe to sit on..
Also the telephone did not work and there was a constant fowl smell coming from the air system. As we spoke to other people in the area it is a well-known fact that this is a young party haunt. We only stayed two nights and had to book another place more suitable. No one appreciates such misrepresentation and having to pay twice for our holiday. as I mentioned no offer of adjustment was made. This is the first time that I have used VRBO and might possibly we that last time. No one cannot justify paying twice. Think twice before staying at this hotel. This booking was during the Christmas vacation and New Year’s Eve celebrations. These two mature ladies wanted a QUIET environment. The hotel has a large housekeeping and cleaning staff. The hotel was full to capacity with families and children because of these two festive holidays. There were New Year’s Eve fireworks and parties and most of the guests were in a holiday and festive mood which is typical in a large hotel at this time of year. This hotel has two very popular restaurants. The outdoor and the fine Italian, Casa Calabria restaurant inside the hotel. Both are extremely popular and busy. I’ve received 4 and 5 Star Reviews and I am a long-standing Premier Partner with VRBO because my condo is so well taken care of. It’s highly sought after and regarded because I am constantly on top of it and live only minutes away. The living room furniture is new, the bathroom and kitchen were modernized and renovated. The recent VRBO video and pictures of it are totally accurate. There are floor to ceiling hurricane impact windows and sliding glass door, the kitchen has many modern appliances. There’s a separate purified water system, a modern cell phone charging station, two large flatscreen TVs with cable, and many more modern conveniences. The hotel staff came to my condo and checked the odor complaint and found nothing. The hotel also came to repair the hotel house phone but they didn’t notify me of these problems until they left. 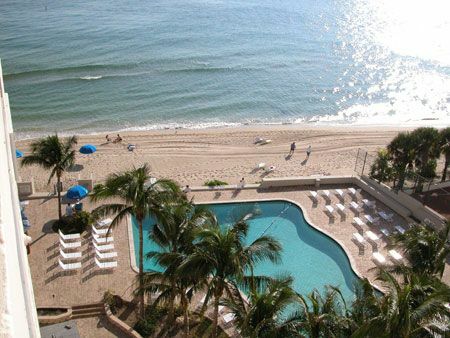 From my high floor, you have a vast panoramic view of the intracoastal and much of Fort Lauderdale using any of the many balcony chairs I have there. Before I could address and resolve any of their complaints they were gone. I’m a very reasonable and understanding person. I felt that I provided everything in my rental agreement and much more. My condo pictures and recent video substantiate the accuracy of my condo’s contents & condition.Their initial & main complaint was NOISE. I don’t feel responsible for their booking mistake to a very popular hotel during this festive time of year, especially if you are wanting a PEACEFUL and QUIET atmosphere. They demanded a refund for their own booking mistake. I completely fulfilled my promise of renting a clean, comfortable condo and felt that their demands were completely and totally misguided. Great location. Beautiful lodging. Staff was very helpful. Owner has wonderful communication. The condo had everything I needed. My family had a great time. The owner was hands on and accommodating. Air mattress needs changing. My experience with the owner was great, always answered emails immediately. However, the pool area was in need of cleaning, mold around edges,water was foggy. I complained and I was told there is a service that services the pool 3 times a week. The lounge chairs were very worn, several chairs were “worn out”. The lobby area was full of “white furniture” that needs to be replaced and the entire lobby area needed to be cleaned and updated. Our condo was very clean but were provided only 4 towels, hand towels and wash cloths for the week. I’m glad to hear that you were happy with my condo & me. I always strive to accommodate my guests’ needs. If you needed more towels, of course, I would have provided them. All you had to do was, just ask. This is the first time I have heard any issues concerning the Hotel property. Issues can arise at times in a Hotel with so many amenities. I have received over 25 5-Star Excellent Reviews. These Excellent Reviews cover my condo, it’s location & the Hotel. All my Reviews say how wonderful the Hotel amenities are & it’s Direct Access to the beach, pool, restaurants & close proximity to local stores. Lovely condo for a great price! The condo was very neat and cozy. Perfect for a getaway! Definitely will be going again in the next year or two! Comme le bâtiment est un condo / hôtel, les équipements sont nombreux. La multitude de commodités commencer par la plage privée / océan. location de bateaux (de scooter des mers), piscine (à côté de la plage), restaurant Tiki Cafe (petit déjeuner, le déjeuner et le dîner), Bleu Tokyo (Fine Dining and Lounge), un salon de beauté, Coffee Shop situé dans le hall (qui fonctionne 24h . ), snack-bar, une connexion Wi-Fi, et une salle de lavage dans l'immeuble. Autre chose que vous pourriez avoir besoin est également situé juste en face. Pour votre commodité, les pharmacies, un supermarché, Cleaners, Pizza, chaînes de restauration rapide, les banques, la thérapie physique, les cabinets de médecins, restaurants, plage Ware et accessoires de plage Boutiques, Lauderdale by the Sea et arrêts des transports en commun se trouvent à une courte promenade le long de la «Galt Ocean Mile. agréments locaux et des attractions qui sont également un court trajet sont Pompano Race Track et Casino, Golf, Las Olas Blvd. avec ses restaurants, plusieurs boutiques en front de mer, magasins, Beach Place, Riverfront, Curiosités le long du canal sur le taxi de l'eau et bien plus encore.